This report covers campaign developments that occur during the Belarusian parliamentary ‘campaigning period,’ which lasts from the end of candidate registration on August 11 until Election Day, September 11. It focuses on candidate campaigning, particularly TV appeals and debates, candidate pickets, and meetings with voters. During the campaigning period, democratic candidates emphasised the “absence of free and fair elections,” as well as their approaches to socio-economic problems. Candidates presented party programmes like “One Million New Jobs” or “People’s Program” as possible solutions to political and economic problems. A portion of the opposition candidates put traditional opposition white-red-white flags on their speaking tribunes during speeches and debates. The call to action differed among democratic candidates. Some called on people to join their parties or participate in election observation. Others emphasised the importance of voter participation, discouraged indifference, and urged voters to cast ballots on Election Day. There were attempts by officials to limit communications of certain democratic candidates by refusing to broadcast TV appeals, rejecting programs, or forbidding the re-publishing of TV appeals on the Internet. The National Democratic Institute (NDI) has observed that a notable aspect of parliamentary election campaigning in 2016 in comparison with recent elections is the shift of most opposition forces’ communications away from internal conflicts and towards voter outreach based on socio-economic issues. The bitter accusations and fierce public infighting that dominated the independent media and enhanced perceptions of a dysfunctional opposition have largely vanished from the 2016 political discourse. Instead of caustic rhetoric against each other, the majority of opposition forces are focused on communicating with voters based on key socio-economic issues and offering critiques of the authorities’ management, and in some cases articulating alternative visions to solve the country's problems. Democratic candidates continued to criticise the incumbent authorities, some quite harshly, in what can be considered traditional opposition rhetoric aimed at a traditional opposition electorate, but these attacks and other traditional opposition issues, like calls for free and fair elections, were often grounded in themes that are relevant to a broader audience, such as the creating jobs, improving roads or developing rural regions. The shift away from internal fights and towards building public support might be attributed to the decision of most major political forces to actively participate in the elections. With many pursuing a similar approach, there is little need to focus on divisions. The busy work of running campaigns and talking with voters might also be leaving little room for playing political games on the side. The change might also reflect the recognition that past squabbles significantly damaged public credibility and that the path to a successful future depends on breaking out of the existing mold to build the trust and support of the public. The final week of campaigning, September 6-10, overlaps with the start of the early vote period. Nearly seven million eligible Belarusian voters are able to begin casting ballots for one of nearly 500 candidates running in 110 districts. Election Day itself is Sunday, September 11. In the last presidential election government reports showed that more than one-third of voters voted early. Election observers criticise the early vote period as being prone to government abuses, including forced voting, artificially inflating turnout through protocol manipulation and vote count. Each registered candidate was entitled to one five-minute television and radio speech and the publication of their program in the newspaper; additionally, brief debates (five minutes of airtime for each candidate) on state TV were held if at least two candidates agreed to participate. Speeches were broadcast on state-owned channels between August 15 and September 2. 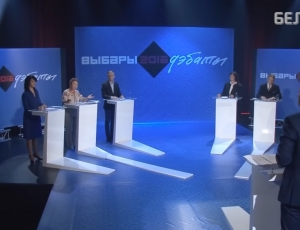 Additionally, nearly 30 candidates participated in debates on “Belsat” TV channel. Topics included culture, regional development, economy, foreign affairs, domestic politics, and social policy. Copies of all debate programs can be found on ePramova.org/debate. Officials found means to restrict the public discussion of issues raised in TV appeals or candidate programmes. Newspapers declined the publication of some programmes, claiming the programmes violated the Electoral Code. The state TV channels did not broadcast some of filmed candidate appeals. For instance, two regional newspapers rejected the program of the United Civil Party (UCP) candidate Nikolay Ulasevich, a “persistent opponent” of Belarusian Nuclear Power Plant (NPP) construction. His TV appeal was not broadcast either. UCP candidate Pavel Stefanovich, who advocates for “marijuana legalisation,” was deprived of publication of his program and the broadcast of his speech. The program of UCP contender Yuriy Haschevatskiy, which mentioned “twenty years of authoritarian regime,” was rejected by “Vecherniy Minsk” newspaper. The “Vecherniy Brest” newspaper initially rejected the program of Igor Maslovskiy, Belarusian Social-Democratic Party Gramada (BSDP-G) candidate, as it included the call “not to support pro-governmental candidates.” An additional problem noted by Maslovskiy was unequal circulation of issues with candidate programs. Maslovskiy, who succeeded in getting his program published after appeals, noted that the “Vecherniy Brest” newspaper gave his program a circulation of 4,300 copies. Meanwhile, the issue including his opponent’s (Vladimir Bazanov, incumbent member of parliament) program had 10,000 copies in circulation. Haschevatskiy’s TV appeal was broadcast on state television, but after it was re-published on YouTube and became viral on non-state media outlets, “Belteleradiocompany” requested its removal, and warned other candidates not to republish their speeches due to copyright infringement. In 2015, however, state TV broadcast the speeches of presidential candidates on their website. Nevertheless, the restriction seemed to invigorate re-publishing speeches and debates on YouTube and other websites. Some Belarus Popular Front (BPF) candidates focused on foreign affairs and international economic issues, emphasizing the value of the country’s independence. For instance, BPF Chair Alexey Yanukevich proposed changing the direction of Belarusian exports from Russia to the West. In addition, he suggested “open borders” with the European Union and the U.S. and establishing “controls” over the Belarus-Russia border to counter illegal migration and prevent the inflow of criminals and drugs. One of the most media-referenced candidate appeals was delivered by BPF’s Vladimir Podgol. He delivered his speech dressed in a bulletproof vest. Other props included a brick, tanker helmet, decorative shells, and his book “Bullet to Lukashenka.” The same title was written on his vest. Padgol explained he wanted be unusual and catch people’s attention. Analysts from Radio Free Europe/Radio Liberty described the appeal as “post-modern.” Considering the number of references, he received in the media, and the 43,000 views on YouTube, it would seem Podgol succeeded in attracting attention. TtT candidates tended to raise socio-economic issues, such as the need for pension system reform, high unemployment and jobs, and an improved business environment and the crisis in the industrial sector.They also touched on the housing affordability issues, underdevelopment of regions, and infrastructure problems. BCD’s Co-Chair Vitaliy Rymashevskiy, participating in state TV debates as a proxy, proposed that newly elected MPs initiate Lukashenka’s impeachment. This was reiterated by BCD youth leader Marina Homich in her speech. BCD speakers raised a range of issues, such as the problem of low salaries and high prices, administrative reforms, economic development, healthcare, and anti-alcohol policies. Tatiana Severinets addressed unpopular laws approved by the parliament, such as the imposition of a tax on unemployed people. BCD speakers emphasized their party’s social values and called for the return of kindheartedness, justice, solidarity, hope for change, and strong families in Belarus. “Electoral fraud” was highlighted by BCD candidates and proxies, some of whom urged voters to join BCD or participate as observers (BCD is a part of “Right to Choose-2016” joint observation initiative). During their speeches, “For Freedom” (FF) candidates addressed issues related to the pension system, unemployment and low salaries, parliamentary accountability poor governance and affordable housing. “Reforms, Wellbeing, and Peace” was a slogan voiced by the movement’s Deputy Chair Yuri Gubarevich. Additionally, FF candidates often referenced their “Narodnaya Programa” (People’s Program), a program of political and economic reforms that could solve the problems in the country. Some of the FF candidates addressed personal and local-level problems. For instance, Viktor Yanchurevich (who presented himself as an independent candidate) stressed Minsk issues: excessive construction and the destruction of green zones. Student candidate Alina Nagornaya emphasised problems in education. Maksim Tikhonov began his speech by challenging the transparency of elections held in Belarus and giving examples of electoral fraud. According to him, “free elections” is the starting point of all reforms in the country. United Civil Party (UCP) candidates often criticised the authorities and raised issues such as the economic crisis and the inability of the authorities, particularly of parliament, to solve problems. Many UCP candidates held up a printed copy of the “One Million New Jobs” program, which was described as a solution to both the political and economic issues in the country. UCP Chair Anatoly Lebedko participated in debates as a proxy of party candidates. Lebedko focused on political processes and tended to emphasize the lack of rotation among the authorities and electoral fraud. The previously mentioned Haschevatskiy focused his appeal on criticism of Lukashenka, the parliament, and electoral fraud. He claimed that the opposition is not weak, but people are weak because they do not support each other. Haschevatskiy called for the return of “stolen free and fair elections.” UCP candidate Pavel Stefanovich, who was not allowed to publish his program and whose TV appeal was not broadcast due to his open advocacy for “marijuana legalization,” took part in state TV debates. There Stefanovich said he wants to implement “different drug policy,” fight for gender equality, and solve the problem of domestic violence. Belarusian Social-Democratic Party Gramada (BSDP-G) candidate appeals addressed social justice issues corresponding to their party ideology. Anna Kanyus used her TV appeal to urge citizens not to support pro-government candidates, who failed to oppose the pension age increase or the tax on the unemployed. Additionally, she advocated for establishing a legal basis to ensure secure future for investors, business, and citizens in order to develop the new economic policy. The BSDP-G candidate in Slutsk, Anatoly Yurevich, emphasised the need to improve Belarus’ “image abroad,” abolition of the contractual system, and increased public control over local and central budgets in order to increase investments and ensure decent wages. Additionally, Yurevich called upon PEC commissioners to count votes fairly. Natalya Shkadun, BSDP-G candidate from Magilev, began her speech by claiming that “parliamentarians are appointed” and they do not perform their duties. As a doctor, she dedicated a large share of her speech to problems in healthcare. “Belarusian Party – The Greens” (or Green Party) ran five candidates. They focused on sustainable development in the country, particularly ecology issues, renewable energy and a green economy. For instance, Dmitriy Kuchuk focused on the construction of the Belarusian Nuclear Power Plant (NPP). He raised concerns about the safety and economic reasonability of the plant. In the end of the appeal, Kuchuk put on a gas mask. Later, Kuchuk explained to TUT.BY that he intended to attract people’s attention as most of the people in his Ostrovets constituency do not watch “Belarus 3” TV channel. According to Kuchuk, this small performance helped him to get views on YouTube (over 8,000) and coverage on a number of mass media outlets. “Fair World” (FW) candidate Mikhail Korotkevich emphasised their party’s program to “ensure the sustainable development of the country and increase people’s well-being.” The proposals are intended to optimize public expenses, increase investments, abolish paid education, subsidize pharmaceuticals and grow wages and pensions. Candidates loyal to the authorities (whether independent or in a political party) tended to support the direction of the country’s development. The chair of the “Belarusian Patriotic Party,” former presidential candidate, Nikolay Ulakhovich addressed patriotism and the importance of peace. On September 5, the CEC announced that candidates for parliament informed them of their plans to organize 180,355 pickets and 3,459 meetings with voters (obviously, not all declared events were really held). Most were traditional events, but a few were covered more in the media because of issues raised or how they were organized. Recently, the Center-Right coalition (BCD, UCP, and FF) candidates and activists marched to the “Belteleradiocompany” building in Minsk, where they criticised the state television and delivered an appeal demanding opposition receive a regular access to airtime on state TV. They also called for the establishment of the independent public television station. On August 25, Center-Right coalition forces organized a picket to mark the anniversary of the State Sovereignty Declaration. UCP held several pickets to engage the public. In mid-August, Lebedko and his deputy Nikolay Kozlov together with registered candidate Denis Tihonenko held pickets in front of Minsk Tractor Works (MTZ) and Minsk Automobile Works (MAZ) to distribute literature which covered their “One Million New Jobs” program. Lebedko and Kozlov also held rallies for “Police Against Falsifications” in front of Minsk police departments to distribute “Narodnaya Volya” newspaper, which included an article “on falsifications during elections,” to police officers. BPF also organised a Minsk picket on August 25, “Independence Day.” BPF’s candidates Vladimir Podgol and Ales Talstyko organised several public artistic performances that satirically criticize the authorities and their policies. The media widely covered a picket of the BPF candidate Vadim Saranchukov, who campaigns in Hrodna for eliminating cross-border restrictions for people living on the border of Belarus and neighbouring Poland or Lithuania. “Green” party candidates raised ecology issues. “Green” candidates were seen campaigning in Svetlogorsk against construction of a chemical enterprise, urging people to vote for their candidate. On August 25, in a joint picket with UCP and BSDP-G in Grodno, “Green” candidate Tatyana Novikova addressed safety concerns related to the construction of Belarusian Nuclear Power Plant (NPP) in Ostrovets. Another picket against the Belarusian NPP construction, Novikova and Kuchuk held in Ostrovets. Domestic observers, “Human Rights Defenders for Free Elections” (HRD) and “Right to Choose-2016” (R2C), reported a number of incidents related to violations of equal conditions for all candidates, such as restriction on mass meetings or attempts of officials to disrupt candidate pickets or meetings with voters, and violations by non-democratic candidates related to production of campaigning materials. In addition, HRD noted in their recent report that “pro-government candidates actively participate in socially-significant events” and “use administrative resources.” R2C, in their report on the campaigning period, stressed “censorship” of democratic candidates, some of which are referenced above and condemned the Electoral Code changes made in 2013, which deprived candidates of state funding. Domestic observers are trying to engage as many citizens as possible to monitor the campaign period and elections. ElectBy.org, in partnership with the HRD, R2C, and Election Observation Theory and Practice (EOTP), has been collecting reports of electoral violations through the mobile application “Vochy.” In addition, HRD announced they are opening a hotline to report electoral violations. As of September 5, 32,015 domestic observers have been accredited by election commissions. The majority of accredited observers are from pro-govenrment public associations – 23,619, including “Belaya Rus’” (4,261), Belarusian Republican Youth Union (BRSM) (6,170), Federation of Labor Unions of Belarus (5,040). The CEC has accredited 821 foreign observers as of September 2. Three hundred and thirty-one are from the Commonwealth of Independent States (CIS), 341 from the Organisation for Security and Co-operation in Europe Office for Democratic Institutions and Human Rights (OSCE/ODIHR), 19 from the Parliamentary Assembly of the Council of Europe (PACE), 39 from the OSCE Parliamentary Assembly (OSCE PA), 65 from diplomatic corps, three from the Association of World Election Bodies (A-WEB), nine from Shanghai Cooperation Organisation (SCO), and 14 from election bodies of foreign countries. Not all international observation groups could come to observe the Belarusian elections. The European Network of Election Monitoring Organisations (ENEMO) mission, which sent request for observation in June, has not yet received “any reply” from the Belarusian authorities (as of the end of August). ENEMO observers did not receive an invitation to observe the 2015 election either. Recently Alexander Lukashenka had a meeting with Kent Harstedt, Coordinator of the short-term OSCE observation mission and Cayetana De Zulueta Owtram, Head of the OSCE/ODIHR mission. During the meeting, Lukashenka stated that he would like to see “true professionals,” regardless of their political views, in a new parliament. On 20 July 2016 Belarus’s new military doctrine came into force. Although there was lively discussion about the contents of the new doctrine earlier this year, its text was not then public. Early speculation focused on officials’ references to new threats including “hybrid warfare.” Even Jane’s Defence Weekly, a highly credible source of military information and analysis, interpreted this as a reference to Russia. However, contrary to the expectations of some Western commentators, the new doctrine consolidates Belarus’s alliance with Ru­ssia and its obligations under the Collective Security Treaty. Although the doctrine proceeds from the claim “that no one state (or coalition of states) presents itself to Belarus as an adversary,” we can infer that the main threats identified are NATO expansion and prospective regime change in Belarus. The two may go hand-in-hand, and we should understand references to hybrid war (the term itself does not appear in the text of the doctrine) – an admixture of traditional and non-traditional methods – in this context. There is no significant change about the origins of security threats in the new doctrine; the claimed expansion of “the spectrum of sources of military threat” is a vague formulation that signifies little. It is the nature of the threats that is perceived differently from in the past. This is Belarus’s third such doctrine, and it complements the military doctrine of the Union State of Belarus and Russia. Sources at the time said that the original military doctrine of 1992 advocated “armed neutrality,” the policy of not participating in any alliance during wartime. Belarus under Lukashenka never seriously contemplated armed neutrality, despite occasional remarks that Belarus will not commit troops outside its borders. The doctrine adopted in 2002 was more compatible with Belarus’s membership since 1994 of a military alliance (the Collective Security Treaty Organisation), and its ostensible integration into a Union State with Russia. However, the European security environment changed significantly after the previous version came into force. These changes necessitated a new doctrine. First, NATO’s 2004 enlargement brought the three Baltic states – two of which have borders with Belarus – into its fold. 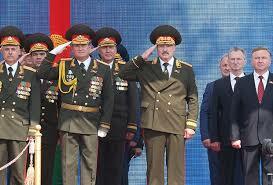 Secondly, Belarus’s leaders watched the “colour revolutions” in former Soviet states nervously. Accordingly, work on the new doctrine was announced long before the annexation of Crimea and the war in Ukraine. On the one hand, the doctrine does not solely respond to recent events in Ukraine. On the other hand, regional instability gave impetus to work on the doctrine. References to “illegal armed groups,” “non-state subjects,” and “private military formations” in its pages are reactions to events in the Middle East as well as Ukraine. This does not mean no threat is perceived as originating from Russia. Despite tight military cooperation between the two states, Belarus’s military would be acting responsibly if it considers the possibility of Russian moves against Belarus. The Belarusians do not know what discussions go on in the Kremlin; for example, details of Russia’s operation in Crimea were probably not shared with Belarus. Russia’s persistent refusal to provide Belarus with requested military equipment is consistent with efforts to minimise Belarus’s autonomy, and has left Belarus dependent on Soviet-era stock. Moreover, in the event of a war between NATO member states and Russia, a land corridor between Russia and the semi-enclave of Kaliningrad becomes a vital strategic interest to Russia. Russia will want to ensure reliable supply lines to its military facilities in Kaliningrad. Belarus needs to think through the implications of such a conflict. Certain Western analysts mistakenly think that all references to “hybrid warfare” imply Russia. For sure, the term hybrid warfare gained currency in the Western press against the backdrop of Ukraine, which link the concept to Russia. However, hybrid warfare has more pedigree than this acknowledges. Debates in military circles date to at least the early 2000s. Russia has used cyber warfare and proxies in Ukraine, and is as capable (if not more so) than Western states of bringing about regime change in Belarus. However, in the Russian literature, which the Belarusian elites read, references to hybrid warfare methods are shorthand for perceived US-led tactics to bring about regime change. Hybrid warfare thus refers to the “colour revolutions” that brought down governments in the mid-2000s. A little ambiguity in the doctrine – it does not name an enemy – serves Belarus well in this respect. It is a mistake, though, to think that Belarus is doing anything other than consolidating its military alliance with Russia. The process of consolidation includes establishing the limits of alliance commitments, and the doctrine is part of a process of ongoing negotiations with Russia. Earlier this year Russian sources announced revisions to the military doctrine of the Union State. This will take into account and nest with both Belarus and Russia’s (December 2014) new doctrines. Both states’ national doctrines underscore the concept of strategic deterrence or containment (strategicheskoe sderzhivanie), which suggests some coordination. Indeed, Andras Racz at the Finnish Institute of International Affairs says it would be “scandalous” if Russia was not consulted on the draft. Belarus will continue to trust Russia knowing it cannot defend itself against an attack by its ally. Russia spends more of its GDP on defence than any other major state; 5.42% in 2015 according to the International Institute of Strategic Studies’ annual Military Balance. In absolute terms this is far less than the USA spends (3.27% of GDP), but a comparison of total expenditure does not tell us very much of interest; the USA’s distant location limits the direct military threat. The leadership in Belarus thinks it has no alternative to alliance with Russia, because Russia would not consent to Belarus’s neutrality. The coming-into-force of an integrated air defence system covering Belarus and Russia reminds us that a break with Russia is neither imminent nor likely in the medium term. The revised military doctrine is part of a process of consolidation and negotiation of the two states’ alliance, and reflects a security environment that greatly changed over the past fifteen years.